This season Quentin Véron revisits the Middle Age and shows us a poetic and mysterious period close to his own world. 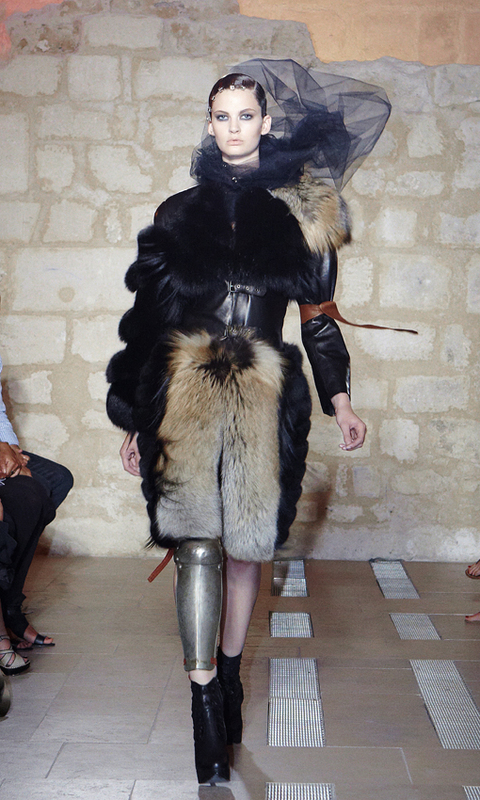 He modernizes the medieval silhouettes; iron’s armors give a way to the fox fur, sleeves are adorned with strips of fur and chain mails are made of leather and fur. The blend of leather, goat long hair points out the atypical style wanted by the designer, and gives to the all collection not only a historical dimension but also a baroque one by using his favoritecolor, black. Each creation uses a mix of fox fur like SAGA Arctic Marble Fox dyed in black, gold cross SAGA fox, blue fox dyed in black SAGA or SAGA Sun Glow fox. By unveiling a collection inspired by the legend of the black knight. Quentin Véron surprises us again with his creativity and offers a journey in his imaginary tale.